The forces of globalization, technology, and information diffusion, as well as the processes of democratic consolidation have served to improve and expand opportunities for business in Latin American markets. These changes have not occurred uniformly, and this insightful book will help future business leaders determine which economies are likely to prosper, and therefore present better business opportunities for the foreseeable future. A chapter dedicated to the history of Latin America helps readers understand why things appear the way they do, giving them the context they need to understand the underlying business conditions. 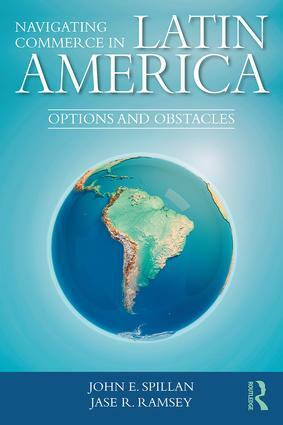 The book also addresses key challenges and issues that are unique to Latin America, and offers practical advice for tackling them. Each chapter features a focus country in order to provide a more in-depth understanding of what business opportunities exist in this region, how businesses operate and thrive there, as well as what internal and external factors affect the ability to do business in Latin America. The cases at the end of each chapter explore actual business ventures in a particular country. A highly practical book, Navigating Commerce in Latin America will give international business people the tools they need to manage successful businesses in this region.